Cyclist Bryan Fogel sets out to expose the truth about drug use in professional sports by showing he can take PEDs and not get caught. He employs the help of a Russian scientist, who becomes the center of the biggest doping conspiracy in Olympic history. We've seen it happen more than once where a documentary starts off tackling one subject and focusing on one thing but winds up being something else entirely. That's the case with Netflix's new film "Icarus," which is directed by Bryan Fogel. When Fogel set out to make this documentary, he intended to show how professional athletes can game the system and pass drug tests despite being on performance-enhancing drugs, also known as PEDs. Fogel was a cyclist and chose to start a regimen of PEDs with the help of a Russian scientist named Grigory Rodchenkov, who gave him tips on how to cycle on and cycle off these drugs in order to pass any in-competition testing that may have arisen. With the right resources and professional help, Fogel was very easily able to cheat the system. About halfway through his ordeal, everything completely changed. If the name Grigory Rodchenkov sounds at all familiar, it's because he became the center of the Russian Olympic team doping scandal. He headed the WADA (World Anti-Doping Agency) accredited lab in Russia that was responsible for all of the testings during the Sochi Winter Olympics in 2014, and most testing in competitive sports in general. WADA has always been known for having the most stringent testing guidelines and the best, most up to date equipment. Fogel began working with Grigory before the whole scandal broke and got to document it from the beginning. Seeking refuge in the United States, Grigory eventually came out to the press and testified for the Justice Department that the Russian government helped its athletes beat drug tests with his help. The documentary then takes a drastic, dramatic turn. It changes from an interesting look into sports and doping to what feels like a full-blown spy thriller as Grigory flees Russia for the US because his life was in danger. Fogel quickly became Grigory's shelter, and he also helped him meet with lawyers, newspapers, and other organizations to try and get his story told. 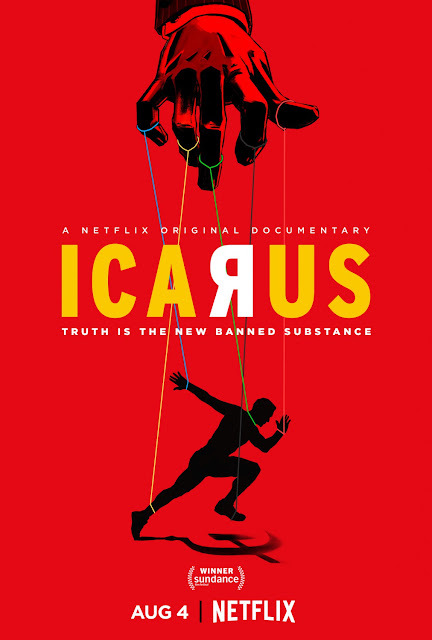 "Icarus" is a relevant, revealing, thrilling and extremely engaging documentary. If you're interested in any kind of sports, we recommend checking this one out on Netflix as soon as possible. It's crazy to watch a movie morph into an entirely different subject in the blink of an eye.